SFR and Bouygues specifically asked permission to use the 2.1 GHz band for 4G, saying it will help improve their 4G speeds. There is apparently an underlying principle of technological neutrality applied to the 2.1 GHz band in France, so this ruling seems like a bit of a formality. At the very least the need to get such a move rubber-stamped by Arcep offers transparency regarding operator spectrum plans and, for some reason, Orange and Free have yet try the same move. “Free Mobile and Orange have the option of submitting a similar request to Arcep, should they so desire,” said the Arcep announcement. 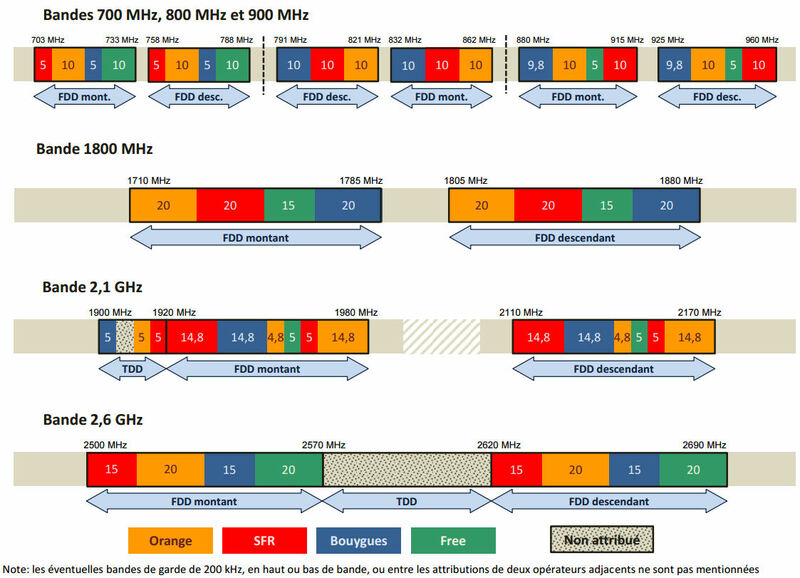 As you can see from the Arcep diagram below, SFR has around 20 MHz of FDD and 5 MHz of TDD spectrum in the 2.1 GHz band, while Bouygues has a bit less FDD. Meanwhile Orange has the same amount as SFR, while Free only has 5 MHz of FDD so it might have decided it’s not worth the effort of repurposing.